On Saturday the second-placed RB Leipzig wanted to take advantage of Dortmund’s drop off points the day before in Stuttgart. With a win, Leipzig would be 5 points ahead of Dortmund. However, in the end, they could only get a draw in Leverkusen who played only with ten men almost the whole second half due to the red card of Benjamin Henrichs. Ralph Hasenhüttl lined up his team in their typical 4-2-2-2 formation. Gulasci played in goal, in front of him Bernardo replaced Klostermann as right back, Konaté and Orban who came in for Upamecano were the two center backs, while the new national team player Halstenberg defended on the left side. Captain Diego Demme and Naby Keita were named as the central midfielder pair. Kampl and Forsberg played wingers/offensive midfielders while Sabitzer, who normally attacks through the right side played alongside Timo Werner up-front. Especially the nomination of Sabitzer as the second striker had a massive impact on the way Leipzig could attack. Sabitzer moved a lot, could use movements from inside to the outside to get players out of possession. Also, he was a constant threat in counter-attacking situations due to his speed. Compared to Yussuf Poulsen Sabitzer is not that strong in the air, while the Danish striker can hold long balls and wait until his teammates get in position, Sabitzer is not that type of player. You could observe Sabitzers strengths before the first goal of Leipzig, the situation which led to the penalty. Sabitzer sprinted with the perfect timing in the space between Aranguiz and the defenders of Leverkusen who could only stop him with a foul. Besides Sabitzer the election of Forsberg and Kampl as wingers had another impact on the attacking style of Leipzig. Kampl who also often plays as a central midfielder and Forsberg both like to push inside. Therefore, Leipzig had a lot of players between Leverkusen’s defensive lines. Adding Werners and Sabitzer diagonal movements created a fluid attacking line. Alongside Kampl abilities in tight spaces, the Slovenian who can also support the build-up, was really important to advance in the ten space. In a few scenes, you could watch that Bernardo pushed higher while Kampl connected the defensive line with Leipzig’s attackers through dribbles and creative passing into the ten-space. Heiko Herrlich, coach of Bayer 04 Leverkusen chose a 3-4-2-1 formation which led to a 5-2-2-1 defensive formation. Bernd Leno played in goal. Lars Bender, Jonathan Tah and Wendell played in the back-three. Wendell, for instance, could push higher in possession, most of the time he started dribblings the create openings in Leipzig’s defensive shape. The winger positions were occupied by two really offensive players. Admir Mehmedi and Bailey both have played strikers or offensive players so far. The wingers often got supported by Leverkusen’s central midfielders Dominik Kohr and Aranguiz. Along with the support of the central midfielders, Bailey and Mehmedi had also the option to find Havertz and Brandt between the lines. Both positioned themselves in the half-space which perfectly fits for Brandt’s abilities of dribble through tight spaces. Volland then was the lonely striker up-front who supported the ball near side constantly and offered a passing option in the depth. Heiko Herrlich had to figure out how to stop Leipzig´s attack before the game. He probably got inspired by Hannover´s pressing before the international break. Hannover was able to disrupt Leipzigs possession game constantly, in the end, they lost the game due to some problems in their defensive structure, but their general game plan seemed to work. Herrlich changed some things compared to Breitenreiters pressing with Hannover. Herrlich added another line of pressure by creating a triangle up-front instead of a flat three-man line. Brandt and Havertz positioned a little bit deeper than Volland, so they could cut all diagonal passing options in the centre. Their main task was to deny passes in the half-space, which was Leipzig’s preferred way of advancing in possession due to the inverted role of Forsberg and sometimes Kampl. Volland up-front used his cover shadow to prevent Leipzig’s centre backs from playing the ball to Keita who offered as a passing option in the middle. Also, Volland started to press the centre backs and therefore started the active pressing of Leverkusen. Compared to Hannover Leverkusen started their pressing deeper. They couldn´t win the ball high up the pitch but in contrast to Hannover they were more compact and didn’t give Leipzig room to operate in the middle. The two central midfielders Kohr and Aranguiz covered the space behind. Rarely they oriented towards an opponent, instead, they covered the space and tried to deny any sort of passing or dribbling option for Leipzig in the centre. The back five played a real back five. Bailey and Mehmedi always stayed connected to the three central defenders and seldom pushed higher to press Leipzig. Those task for Leverkusen’s players created a compact defensive shape which was hard to overcome for Leipzig. Especially because the central defenders couldn’t find the offensive players between the lines with a long flat pass nor were long balls successful due to the inability of Werner and Sabitzer to hold those long balls. Furthermore, Demme and Keita constantly were in numerical disadvantaged situations, all five players of Leverkusen could press them when they received the ball between the lines. However, Leipzig got other spaces to attack Leverkusen’s shape. Due to Brandt and Havertz inverted role and the passivity of Bailey and Mehmedi Leipzig received space next to Leverkusen’s defensive shape. In the picture above the coloured space. From there they could start multiple attacks with diagonal passes in the ten-space. Especially Kampl deeper role, maybe a reaction from Hasenhüttl on the defensive shape, helped Leipzig a lot because Kampl is pretty comfortable in tighter spaces and also is able to solve situations with dribbles. All in all, Leipzig’s attacks were not that dangerous. Leverkusen defended concentrated and shifted precisely. However, the early goal by Werner didn’t force Leipzig to attack through a structured build-up from behind. Moreover, they could concentrate on pressing with different intensity and so could win the ball from Leverkusen. After the ball recovery, Leipzig was strong in finding spaces. The likes of Werner and Sabitzer up-front helped Leipzig to counter-attack quickly. Besides the normal interceptions, Leipzig recovered the ball so quickly due to their counter-pressing. After a successful counter pressing the opponent normally is out of position so Leipzig received space to attack. Especially, the high role of Aranguiz and Kohr gave Leipzig space to counter. Leverkusen couldn´t prevent counter attacks after their counter pressing failed. Forsberg, for instance, had a lot of space in the center because Kohr and Aranguiz both shifted out of the centre. The game had only a few goal chances. Of course, because Leipzig scored that early, so Leverkusen had to find a way through Leipzig’s block. Also, both teams defended really well and made the available space as tight as possible. As I mentioned Leipzig focused on diagonal passes into the ten-space and quick counter-attacks. Leverkusen tried to come behind the last line of Leipzig with quick one-touch combinations. Their system generated certain superiority’s in possession. Mainly the position of Brandt and Havertz. But from behind. The back-three should have generated a numerical superiority for Leverkusen in their build-up phase. However, Leipzig pressed high in the first minutes until they went in front. Leverkusen’s first line was positioned to flat. So, it was easier for Leipzig to press. Also, the centre backs didn’t take a wide position to stretch Leipzig’s pressing. As a reaction, Leipzig pressed with four men the first build-up line and their central midfielders. Leipzig was so successful because they could let the ball far side open. Due to Leverkusen’s weak structure, Leverkusen couldn’t switch the play quick enough to take advantage of Leipzig’s ball near superiority. After the first goal, Leipzig settled deeper giving Leverkusen’s center backs more time on the ball. Also, Leverkusen’s structure improved. Now you could see the plan of Heiko Herrlich against Leipzig´s 4-2-2-2. Leverkusen formed triangles and diamonds in the halfspace. Furthermore, their players shift far to the ball near side to support the ball carrier. The back-five was the only constant factor in their possession game. The centre backs and the winger hold their position while the rest could move more freely especially to support the ball near side. In this picture, you can see Leverkusen’s structure. Bailey and Mehmedi stayed wider to stretch Leipzig´s defensive shape. The three centre backs offered a save passing option and were responsible for switches. Aranguiz and Kohr both hold their position but stayed always close together. Wendell also played an important role in their build-up. The Brazilian who normally plays as a left back often advanced with the ball in the midfield. Those dribbles created situations in which one of Leipzig’s players had to step out of position and attack Wendell, as a result one of Leverkusen´s player lost his opponent and became a free player. Havertz and Brandt were the most important players in Leverkusen´s strategy in possession. Both formed the top of the diamond, so Leverkusen used both for quick layoff-passes. In this example, Mehmedi solved the pressing situation by passing to Havertz who gave it to Aranguiz with the first touch. Leverkusen, therefore, could use the space, however, Aranguiz couldn´t control the pass with the first touch and Leipzig was able to recover. Brandt movement onto the right side showed his positional freedom. Because Havertz dropped a little bit deeper Brandt pushed more towards the right side. If Aranguiz controlled the ball Brandt would be in a dangerous position for Leipzig’s last line. Both offensive midfielders offered a passing option for their central midfielders or the centre backs in the half-space. With quick layoff passes Leverkusen could play out of Leipzig’s pressure. Furthermore, when Leverkusen moved the ball well, both wingers, Bailey and Mehmedi could find Havertz and Brandt with diagonal passes between Leipzig’s lines. Especially Keita and Demme had always been aware of the position of Brandt and Havertz. Julian Brandt could use his dribbling abilities in tight spaces when he received the ball between the lines and was, therefore, a constant threat for Leipzig. Heiko Herrlich changed one thing in the break. Benjamin Henrichs came in for Admir Mehmedi. The first few minutes Leverkusen could create some chances. Now Leipzig focused more on being compact in the middle. Leverkusen, therefore, could find his wingers he pushed higher up the pitch. Through crosses, Leverkusen created two dangerous opportunities to score. But again, Leipzig scored early. After a cross into the box, Benjamin Henrichs could only block a shot by using his hand. As a result, he got sent off. Forsberg scored the penalty and Leipzig again was up-front. And one man more on the pitch. However, in the following minutes, Leipzig struggled to use the majority. Instead, Leverkusen could create some chances through counter attacks and quick combinations from the wing through the half-space. Brandt took over the position of Mehmedi/Henrichs. Havertz and Volland left occupying the space between the lines. While Leipzig had possession, Leverkusen formed an asymmetrical 4-3-2 or a 3-4-2. Julian Brandt constantly positioned higher than Bailey on the other side. Leipzig struggled to move the ball well and therefore get Leverkusen out of possession. With Augustin for Keita they now had a real striker up-front. Kampl played the second half as a central midfielder. But Leipzig concentrated more on counter attacks and rarely tried to slow down the game. With that approach, they lost a lot of balls. Leverkusen, therefore, had a lot of possession although they were only ten men. Like in the first half they created their dangerous situations through the wing and half-space. Volland who only gave depth in the first half, participated even more in the second half in the combination play. He took over the role of Brandt and together with Havertz they often were the top of those diamonds. With Brandt cutting inside Volland had a passing option for his layoff-passes, while Havertz on the other side tried to integrate Bailey more into the offensive game. Aranguiz still pushed higher to support the offensive players. With Kohr and the forward pushing, Wendell Leverkusen had still to players in midfield left and also Bender and Tah behind them. Clearly, Leipzig got more space for their counter-attacks, especially Timo Werner was really strong in the second half, he often left the centre and started his dribbles on the wing in counter-attacking situations. 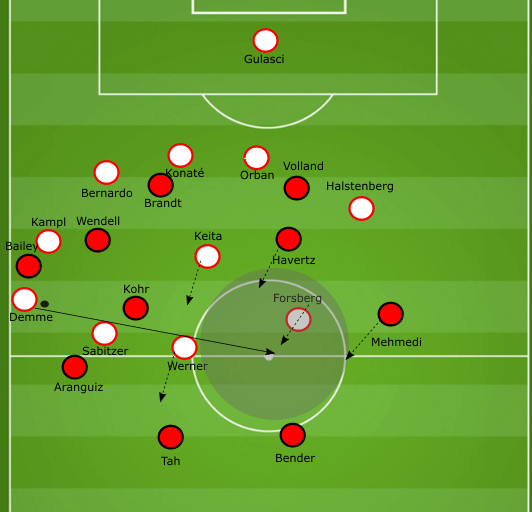 Through diagonal attacks, Leipzig could get dangerous opportunities. Leverkusen still had a lot of players located near the ball. The advantages were the short passing option and connections, also, Leverkusen could quickly counter press. However, when Leipzig could play out of that pressure they found a lot of space on the ball-far side. In the end, Leipzig couldn’t manage to score another goal, while their defensive shape was not that compact anymore. During the second half, they defended more and more in a real 4-4-2. That’s why they had less access to the ball carrier and Leverkusen could push Leipzig deeper in their half. Consequently, they created chances and scored the equalizer which by the way was not undeserved. In a really intense game, Leverkusen will be happy about the one point due to the course of the game. Their 3-4-2-1 created some superiority for them. Through flat and quick combinations Leverkusen got dangerous, while Leipzig concentrated more on the counter attacks due to their early goals in each half. All in all, the game was embossed by the good counter pressing and the compact shape defensively of both teams. In the end, Leipzig missed the opportunity to keep the second place in the league. For Leverkusen the point was good but they need more wins to reach their goals this season.